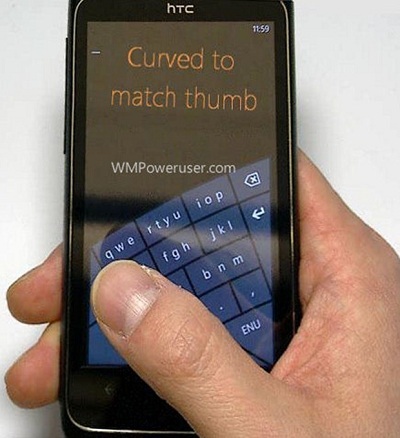 With the launch of the Windows Phone 8 OS, it seems that Microsoft is also working on a new soft keyboard for Windows Phone devices. A picture showcasing how the new arced soft keyboard could look on arrival, been obtained by WMPU from a supposed Microsoft Research presentation as you can see above. This keyboard seems to have been designed for enabling users to type in their Windows Phone by just using their thumb, conveniently. The keyboard has keys which are grouped together in the QWERTY keyboard ordering and the user will be able to decide which word is being typed. From the look the keyboard looks a little weird but you never that the working of it could be a life changer for all the users who crave for a keyboard on which they could type one-handed. The keyboard in the picture is showcased on the HTC Trophy which could mean that we may also see this feature arrive on the older Windows Phone 7.5 Smartphones as a Windows Phone 7.8 upgrade. What do you think of the new keyboard? Would you use it?